This is the time of year hikers begin planning and training for a major thru-hike in the spring. Some backpackers will experience a let-down if they are unable to find the time or the wherewithal to hike the Appalachian, or the Pacific Crest, or the Continental Divide trails. But what about a shorter trail that gives one a long-distance experience? One having sections as demanding as anything you will see on the Appalachian Trail? I submit Vermont’s Long Trail. I hiked it in 2004, the year after I’d done the A.T. and had no idea the last sections would be so rigorous. I’m embarrassed to admit that I didn’t even read up on it, figuring that it wouldn’t be daunting for an A.T. thru-hiker. Some of the scrambles, like the Mt. Mansfield Chin, are downright dangerous. When I made it to the end, right at the Canadian border, I was glad to be done and felt that I’d really accomplished something. 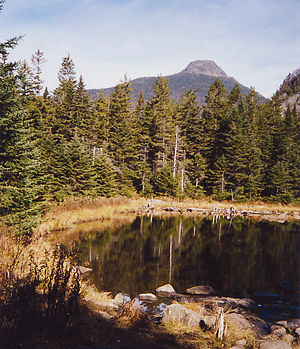 The Long Trail, the oldest long-distance hiking trail in America, is a 272 mile footpath traversing the length of Vermont from the Massachusetts line to Canada. Shelters accommodate hikers, and the trail is rustic and scenic. There are advantages to doing the Long Trail before a major thru-hike like the A.T.
1) You will get a good idea of what you are in for if you want to tackle one of the big three thru-hikes. If you can do the Long Trail, you should be okay on the Appalachian or Pacific Crest trails. 2) The Long Trail is the perfect place to test gear and equipment. 3) You tune your legs and body for the larger adventure. 4) You become familiar with how to re-supply, hitch into towns, and otherwise develop a system of thru-hiking. 5) Because it’s shorter, you can pick the best time to hike it. I suggest late summer or early autumn. The Long Trail in Vermont is a worthy test for you and a great hiking experience. This entry was tagged Appalachian Trail, backpacking, camping, hiking, long-distance hiking, mountain, The Long Trail, thru-hiking. Bookmark the permalink. OK. Now I just need to make my away out east. How much time would you suggest one should put aside for such a trek? I’d say not less than a month. With logistics, resupply etc., five weeks might be best. Let me know if and when you swing this way. Happy trails!